Who knows or has even heard of Lonnie Johnson? “I was old enough to have felt first-hand the old country blues … And I got to see how those blues were modified and modernized by artists like Lonnie Johnson.” Thus BB King. – and UK skiffle artist Tony Donegan – who changed his name to Lonnie in 1952. “Of the forty ads for his records that appeared in the ‘Chicago Defender’ between 1926 and 1931, not one even mentioned that he played guitar.” (Elijah Wald, Escaping the Delta : Robert Johnson and the invention of the blues, 2004) So why a guitar hero? 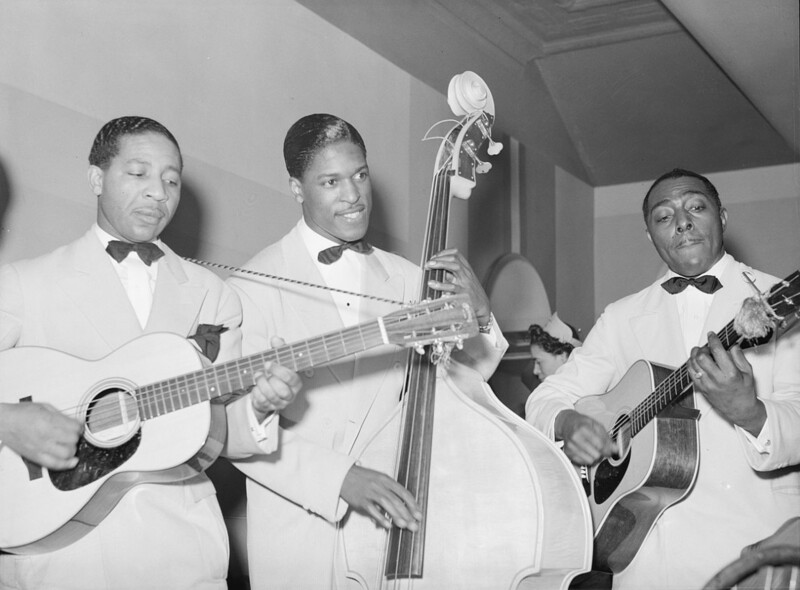 Johnson was responsible for bringing the instrument out of the rhythm section – where it had superseded the banjo in the jazz line-up – to the front as a solo instrument, with single-string picking, bending the notes and ‘voicing’ it like the violin he had played before. You can draw a straight line from there to rock ‘n’ roll and the modern guitar ‘hero’. Coinciding with electrification of the instrument – around the same time as the violin – was of course influential, as was the style of other players like white guitarist Eddie Lang. But to hear how well he plays, and how fresh he still sounds, try this 1928 recording with Don Redman – Fletcher Henderson’s arranger – the Dorsey brothers and Jack Teagarden. This was the band which became the Chocolate Dandies.